Veterans In Politics International has endorsed the following municipal seat for the Special Election Las Vegas City Council Ward 2. 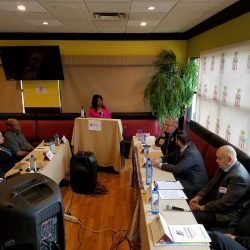 On Saturday, April 6, 2019 Veterans In Politics International (VIPI) has conducted their endorsement interviews for Municipal Candidates for the Special Election Las Vegas City Council Ward 2. The event was held at the Fire Rock Steakhouse and sponsored by Real Water and Michael Broadway Realty One Group Mountain Desert – Associate Broker. This interview process was moderated by Bob Beers former Las Vegas City Councilman Ward 2. The chaplain was George Chehade VIPI Minister. The interview panel members were Tom Bush /VIP Intelligence Officer, Nathan Atkins /US Army, George Chehade /VIPI Minister, Danny Vella /former Henderson City Council Candidate, and Burke Hall /US Army. If you don’t like who we endorsed educate yourself on the candidates that are running for elected seats. We have invited every single candidate that has placed their names on the ballot, some candidates had a conflict in their schedule, some are afraid of the questions we might ask and others are afraid of our open and transparent process. 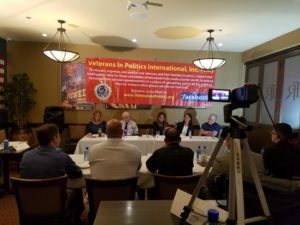 The Veterans In Politics International is the ONLY organization in the state of Nevada that has this type of transparency in regards to our endorsement process. We have nothing to hide, we can’t say the same about some of the candidates that have placed their names on the ballot. Our organization is in full support of Victoria Seaman. Please click onto the links below to view the 5 candidates in attendance for Veterans In Politics Special Election Las Vegas City Council Ward 2. Thank you to all the candidates that have participated in this endorsement interview.